Travel with Kevin and Ruth! 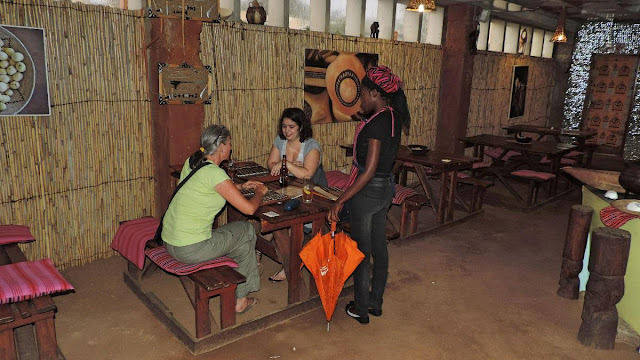 : A Taste of Africa...literally! We had a nice typical "English" breakfast cooked up for us yesterday morning as the last part of our tour package organized by ATI Tours. Scrambled eggs, bacon, sausage, potato, coffee, orange juice. It would be the last normal meal we had that day! Then we sat with Charlotte from ATI and reviewed our trip. It was good to be able to go over things with her and besides giving them feedback on some of the places we camped, we also were able to pick her brains about our travels for the next four weeks. When we were done with Charlotte, we had made plans to meet up with our couchsurfing host Antoinette at her apartment. The only thing was figuring out how to get there. It was only about two kms (1.3 miles) away, but we had our bags with us plus some leftover food that we wanted to keep. So we decided to take a taxi. There are quite a few taxis buzzing around the city, so we thought about just going to the corner and flagging one down. But the guest house says they will arrange one for you. So even though we knew this would be more expensive, sometimes the convenience factor is worth the extra. This time, it was not. We had asked for the taxi to pick us up at 10:00am. He was 10 minutes late, which was frustrating because we knew Antoinette was waiting for us. Then, we tried to explain where we were going, and the guy was clueless. Because this was a "car service" for tourists, this guy knew where the airport was and where the tourist accommodation was...and that's about it. We even had a map with us, but it seemed to me this guy wasn't that good with the written word. We ended up guiding him there ourselves, and for the five minute ride we had been told it would be N$40 ($4.32) each. Then, the guy says no, it's N$70 each ($7.56) each. I handed him his N$80 and told him that was way too much, knowing that a regular cab would have been half that. I hate it when the locals try and take advantage of tourists. Sure enough, Antoinette was there waiting for us. She's a chartered accountant and just works around the corner so she had taken a few minutes to let us into her apartment and give us some keys so we could come and go as we please until she got off work. We made plans to go for dinner, and you'll have to continue reading to see our dinner! Then, we set off to walk the sights of downtown Windhoek. It was very BUSY! Apparently people only get paid once a month and it's towards the end of the month. And Christmas is big here, so the stores were full of people. Too full. We needed to get a card to top up our cellular internet stick and found the MTC store but the lineup was out the door. We eventually found an independant seller who wasn't as busy. You buy a little card for a dollar amount and then scratch a code which you SMS to the cell carrier. This tops up your account so that you can buy a data package. It's pretty expensive, with 1GB of data going for N$235 ($25.38). As we were wandering shops, we came across a huge GreenSport store. This is a camping and outdoors store similar to MEC in Canada or REI in the U.S.. Really interesting looking around around in there and seeing some of the camping implements and tents and fridge systems available. Camping is a big deal in Namibia, with both locals and foreign tourists. GreenSport makes top quality equipment and some of the things are of far better quality and design than what you would find in North America. Meteorite display. There was a huge meteorite shower in Namibia in prehistoric times, and 35 of the meteorites found are on display in an art display in the outdoor mall in Windhoek. 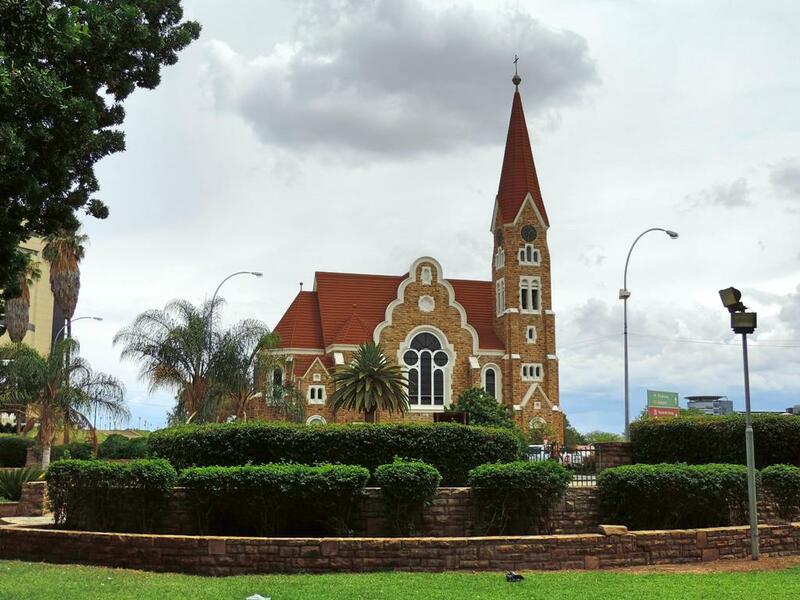 Christ Church is a well known Windhoek landmark. Then we needed some lunch and decided the best way was to go to a grocery store and pick up some rice crackers with some cheese and sliced meat and grapes and yogurt and find some green space to have a picnic. So that's what we did, but we have never been in a grocery store that busy! I should have got a picture. You know how grocery stores have a line of a dozen or more cashier tills but half of them are closed? Well this place had every till open and a huge lineup at each one. Thought I was going to die of starvation before getting out of the food store! Found our way to the park at the Namibia Parliament. Pretty spot, and we found a bench to sit and eat. Pretty spot at the Namibian Parliament. Yikes. Good thing they let us eat our lunch there! This is a new museum. It's not open yet, but what an interesting building design! We had seen a sign for the Namibian Tourism Board. Yes, they are the people who paid for our trip, so we decided to go to their office and find someone to thank! We met Rebecca who has been following our facebook page updates and had a good talk with her. She also let us use one of the windows in their 8th floor office to get a good pic of the city! We met up with Antoinette back at her apartment and she drove us to the Xwama restaurent in Katutura. This is the township where the colored people were relegated to live during apartied South Africa. The guide books and tourist people will tell you to only go here with a guide, but we found that during daylight hours it would be perfectly fine to go by yourself. 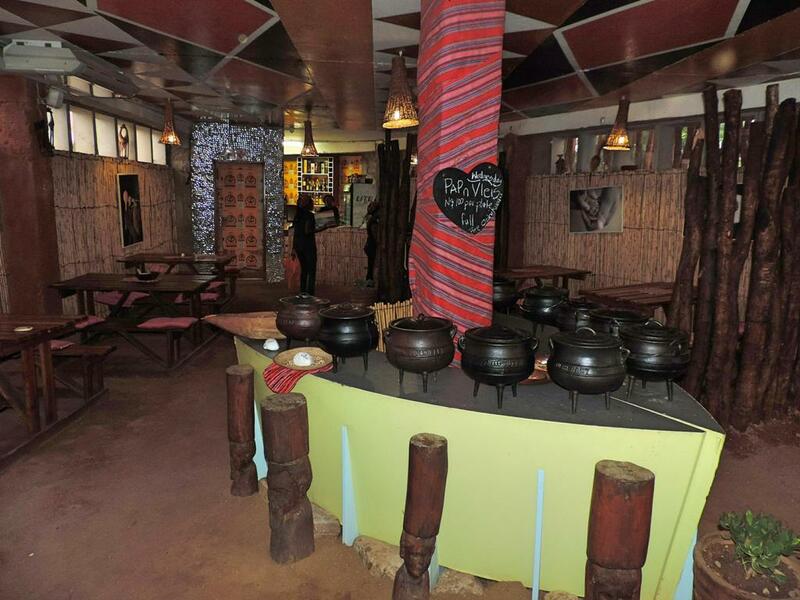 Xwama restaurant bills itself as an "authentic" African experience, and sure enough it was! Want some "Grilled chicken livers, sided with Ox fat spread and a hot chili sauce"? Well we had some. And how about a bowl full of "Omagungo"? Boiled mopane worms!! Sure, we'll have a bowl. Mopane worm. For dinner, or a nice light snack! Ruth, about to take the first bite! Antoinette, eating out of her comfort zone! And Kevin, about to crunch down! So what did the mopane worms taste like? We sort of thought it was like dried salted fish! Not bad, but not something I would eat on a regular basis. I think we liked the deep fried grasshoppers we had in Mexico better. Except when the legs got stuck in your teeth. And for main course, Marathon chicken with Marula nut sauce. Oh, and a side of "Omboga", a free range growing vegetables similar to spinach. but with crunchy bits that feel like sand. Now we know why Namibians are not so fond of their veggies! Our waitress Frieda, dividing up our maiz meal. The chicken was good though! Oh, and so was the bean soup, which was not so much like soup but a kind of paste. Good thing because you had to eat everything with your fingers! Total bill for the three of us including tip, four beers, and a cider? N$340 ($36.72). Reasonably priced, and a great experience. Really worth it, and thanks to facebook fan Leonora for suggesting it! After dinner, we went to a pub near Antoinette's apartment. They do a Monday night quiz night there and it's a busy event! We were welcomed to a table of her regular friends where we competed against 8 or 9 other tables in a variety of abstract questions. Our table came in second place! Some of the random questions? "How many points are on the maple leaf on the Canadian flag"? Lucky that our table had a couple of Canadians sitting at it!! Ruth got it right with 11. "What is the German company "Recarro" known for producing?" Kevin added to our tally of correct answers by getting this one right. Bucket seats for cars! It was great fun, one of our best night's out for a long time! Getting the blog posted early this morning as we're headed out for a long day's drive to Etosha Safari Lodge! Thanks for introducing me to a new restaurant in Windhoek! 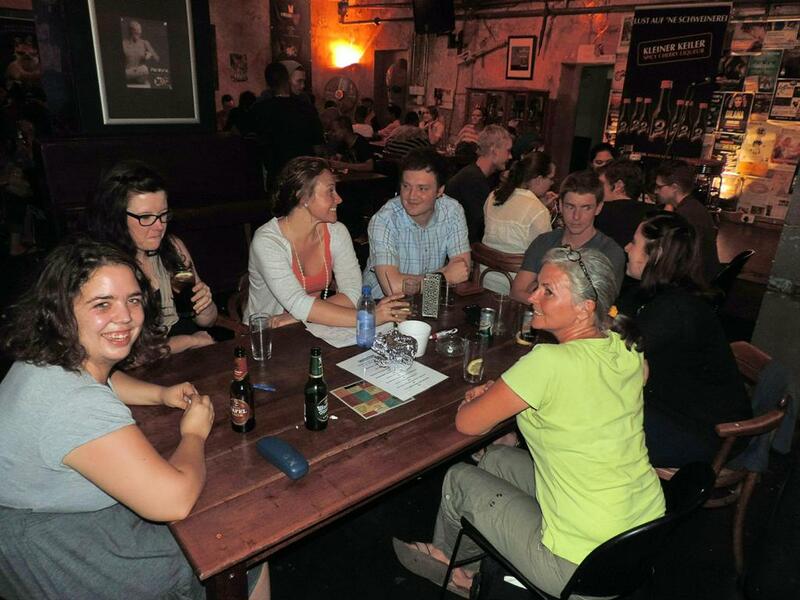 It was a lot of fun, and your knowledge at quiz helped us to score that second place! Safe travels! Thank you so much for hosting us Antoinette, we had such a fun time too! Too dad that we missed a tie for first by only 1 question! Sounds like being back in town was a good experience. I'm pretty daring, but maybe not with the worms. Have you stopped to think where you are on the globe compared to where you are from? How many people never make it off their continent? Pretty interesting stuff to think about. We are always amazed when we see a map and see where we are! I think it makes a difference eating the worms because they are cooked. We would both have a very hard time to eat something that is alive which is what some cultures do with food. Looks like you had a wonderful visit and a very interesting meal. One that we won't forget! That is what we are hoping to do with our blog, showing people what other countries have to offer and most people are surprised by the results. Great story! What a day! When I said new adventures the other day I didn't mean worms! Nice to see you socializing with the locals. You know us Contessa, we are just about willing to give anything a try, within reason of course. Hopefully we will have some more opportunities to meet the locals. No worms or grasshoppers for me either, thanks. Having a wealth of useless information floating around in my head is the only thing I got going for me, although I might have had to do a mental drawing of the flag to count the number of points. Enjoy your taste of civilization, incompetent taxi drivers and all. UGH on the worms, no thanks. Would feel like I was competing on a Survivor episode! There were about 8 or 10 seats downstairs where we were and more upstairs. By the time we left most of the tables were occupied with what looked to be mostly locals. I think it is a pretty busy place. We are glad that we went and that we experienced this part of the culture but not sure we would rush back there too quickly, lol! Glad you got to try the worms, very accurate description of what they taste like. We are glad that we tried them too. As for the description, we both looked at each other and just about replied in unison about our thoughts on the taste. Great post! Don't blame you for being irritated at the taxi. Seems you had a sense you might do better on your own with that. Interesting sounding meal. I'd be game for at least one bite! HA! We are ready for South Africa! We can see the sea! Well that was a different Christmas. Rain turns the dirt roads to mud! From one desert to the next. Watch out for vipers and puff adders! A cultural experience to remember! Not a great end to a long day. We took a day off. The day did not start off good. Namushasha River Lodge Boat Trip...Wow! On the border of Angola!